We are thrilled to have another guest post from a Junior Chef (Jonah Schaik). In a blender or food processor, combine the basil, spinach, garlic, and olive oil. Blend until smooth. Season to taste with salt and pepper. In a large pot of boiling salted water, cook the pasta until al dente, 8 to 10 minutes. Reserve 1 cup of the pasta cooking water, then drain the pasta and return it to the pot. While the pasta is boiling, cook the turkey: In a large, deep skillet over moderate heat, warm the olive oil. Add the ground turkey and cook, stirring to break up the meat, until just starting to brown, about 10 minutes. Season with salt and pepper, then transfer the meat to a plate and reserve. In the same large skillet over low heat, warm 3 tablespoons of the chicken broth. Add the onions and bell pepper, and sauté, stirring occasionally, until softened, 8 to 10 minutes. Add the garlic and sauté, stirring occasionally, 5 minutes. Add the basil and the dried red pepper, and return the cooked turkey to the pan. Add the remaining chicken broth, and simmer over low heat for 10 minutes. Add the pesto to the pasta. Stir well to combine, adding the reserved pasta cooking liquid as necessary to loosen the pesto. Add the turkey sauce to the pasta and cook over low heat, stirring to combine, until heated through. Serve hot, with freshly grated Parmesan on the side. How was my summer…you ask? It was the best summer ever! 53 other kids from around the United States and I experienced something so unique that set us aside from all other kids in the United States. We had lunch at the White House and met Mrs. Obama and President Obama. On Monday, August 20th, 54 Junior Chef’s attended the first Kids’ State Dinner luncheon hosted by Mrs. Obama and Epicurious. It was such a fun, wonderful event. Back in June, my mother’s friend told her about a healthy recipe contest challenge Mrs. Obama was having with her Let’s Move campaign. I decided to enter the contest by recreating my favorite dish, Pesto Pasta. Originally, my recipe was made with Italian Sausage and regular white pasta. I made it healthy by switching the Italian Sausage with Ground Turkey Breast and the Pasta to Whole Grain. The judges not only thought my recipe was the best one in Illinois but they also liked the story attached with my dish. My little brother, Jacob, could never eat Pesto because Pesto is traditionally made with nuts and cheese. Jacob has many dangerous food allergies including nuts, peanuts and diary. I made my pesto so Jacob could also enjoy my recipe. The White House visit is probably going to be one of the best experiences my mom and I will ever have. 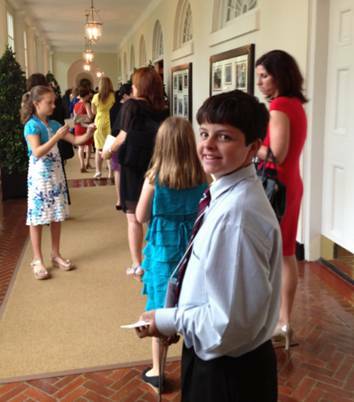 It was an honor to enter and dine in the White House. The event was a lot of fun and it was really cool meeting the other winners. We really liked meeting Mrs. Obama and taking a picture with her by ourselves but I think the best part, was when President Obama crashed the party and surprised us with a visit. He went to every table and shook everyone’s hand. He was the best. We also met Sam Kass, the assistant White House chef. He was really cool and he’s also from Chicago. He gave us a tour of the White House garden, which is amazing. They grow everything in the White House garden; herbs, lettuce, corn, watermelon, potatoes and other fruits and vegetables. My visit to the White House has really made me think about eating healthy, exercising more and how important it is for kids and their parents to be healthier in America.